However, in some manuscripts the authorship is ascribed to Patriarch Sergios, or George Pisides, or Patriarch Germanos, or even Patriarch Photios. 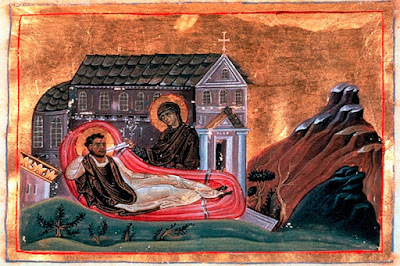 Only one manuscript ascribes it to Romanos, but this is in conjunction with Patriarch Sergios. One can only speculate who the author is, but it does seem to be someone who has mastered the style. Taking into account all the elements that constitute the greatness of the poem: power of expression, boldness of similes, perfect harmony of the lines and, above all, poetical vision, no other poet but Romanos could have been the author of the Akathist Hymn. "Why do the Greeks boast and puff themselves up? Why do they dream of Aratos, the thrice-accursed? Why do they err after Plato?" There is another factor that may prove the author of the Akathist Hymn to be Romanos. Byzantine Hymnographers either composed their poems in a new metre and to a new melody - these composition are called Idiomela - or to the metre and melody of other hymn-writers or former hymns of their own; the latter are called Prosomoia, and bear the rubric "To be sung to the melody of...". In Romanos' Kontakion on Joseph of Egypt, in Cod. Corsin. 366, the rubric reads: "To be sung to the melody of An Angel of the Highest Rank (Ἄγγελος πρωτοστάτης)." The words to this rubric refers to the beginning of the Akathist. We have no reason to doubt the rubric is authentic. Therefore, we see here Romanos referring to a former hymn of his, the Akathist Hymn. Since we know all the other hymn-writers to whom the Akathist is ascribed lived after him, we can be certain Romanos was referring to a former hymn that was his own. The main and pretty much only argument against the authorship of Romanos is the Prooemium Τῇ ὑπερμάχῷ στρατηγῷ (O Champion General). This makes the hymn a Victory Hymn, which bolsters the claim that the Akathist was written after a seige against Constantinople, as the Synaxarion suggests. However, evidence suggests the Prooemium was added at a later date, and probably written by either Patriarch Sergios or Patriarch Gregory and added to the Akathist, which was chanted following the victory over a certain siege. No one believes the entire Akathist was written the day the siege was over, but that it preexisted. And since stylistically the Prooemium does not fit the rest of the Akathist, and it could have indeed been written in a day, its later addition makes perfect sense, and further adds to the argument that Romanos was indeed the author of the Akathist Hymn, a hymn of praise to the Most Holy Theotokos, who appeared to Romanos in a vision and gifted him with the ability to write heaven-worthy hymns and chant them angelically.